Never Enough Nails: More OPI San Francisco Collection swatches! The OPI San Francisco collection was sent for review. All opinions are my own honest thoughts. Today I have half of the non-Liquid Sand part of the OPI San Francisco collection for your viewing pleasure! I was surprised by how much I liked these polishes. Some of them are shades that I felt I already had, but they really impressed me formula-wise, so I feel like they are all really good polishes to have in your collection. I started off with OPI A-Piers To Be Tan, a butterscotch-y tan creme. This kind of rich-looking tan feels like fall to me for sure. I can almost hear the leaves crunching! A-Piers To Be Tan was very nicely pigmented. I only needed two coats and it was so easy to apply. It's a great example of how good the OPI creme formula can be! OK, I can hear some of you already about the frostiness and brushstrokes, but I'm just going to be honest with you. I like frosts sometimes!! Ahhh, don't hate me!! I really like the frosty silver-laced blue of OPI Dining Al Frisco. It's very reflective looking on my nails and was kind of flattering on me. I rated the application as "good" only because there are visible brushstrokes with this polish. The pigmentation of this polish was outstanding. I did only one coat on one of these nails to show you how good the opacity was. Can you guess which nail only has one coat? No? It's my pointer finger. Dining Al Frisco was really easy to apply, but if brushstrokes and frost bother you, you will probably want to leave it behind. I know that no other human being I see in person will notice that my polish has brushstrokes, so I'll still wear this one. OPI Haven't The Foggiest is a gorgeous gunmetal foil. For some reason, I was expecting this to look like other things I have in my collection, but it really didn't. It's so much more rich and pigmented, for one thing. For another thing, the deepened gray silver is darker than other silvery foils. I just want to wear this NOW! Even though it's still summer! Another reason why Haven't The Foggiest beats every other foil in my collection is it's superior pigmentation!! 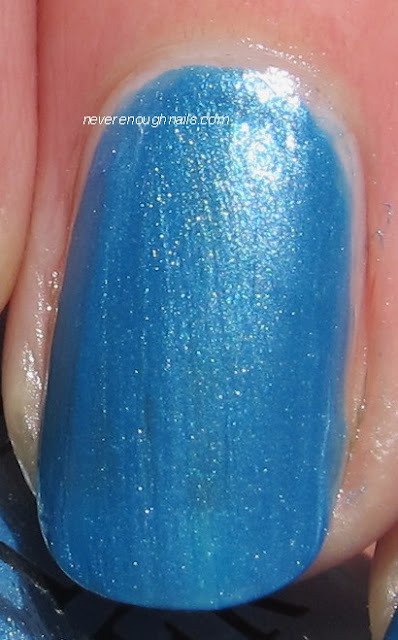 This is two coats and it had none of that sheer patchiness that other foils sometimes have. It was nearly opaque with one coat, but I did two to really get full coverage. This applied perfectly, no problems at all! 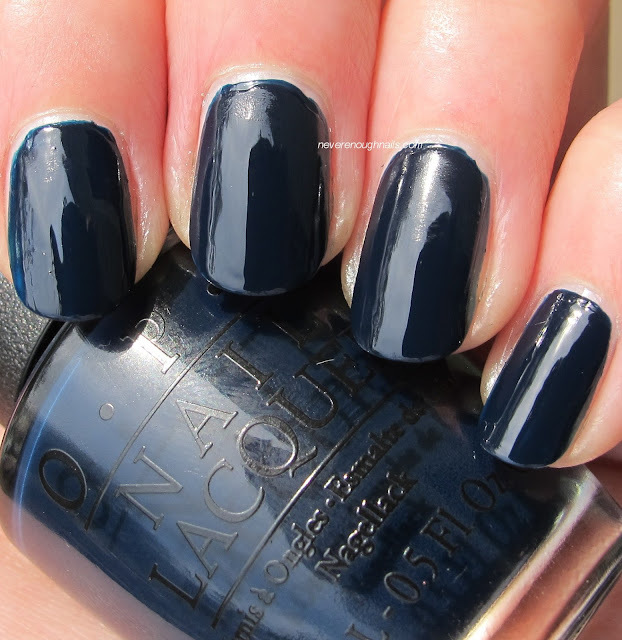 OPI Keeping Suzi At Bay is a beautifully rich medium blue creme. It's kind of the fall cousin of the bright blues like Baker St. and Butler, Please. It looks a bit darker in the bottle than it does on the nail. 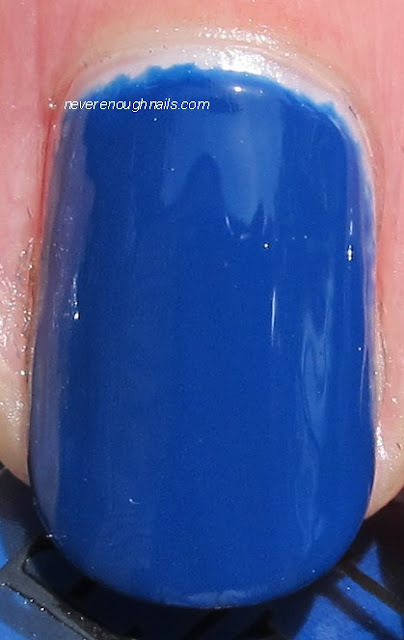 I am a giant sucker for blues of any sort, but especially of this particular medium, bright but also rich looking, shade. It's no wonder I am well into my second Helmer drawer of blues! Keeping Suzi At Bay was another dream to apply. At this point in swatching, I was really impressed with the formula and pigmentation of these polishes. This is two coats again and it is perfectly opaque. Just as a note, this is a straight creme, the bit of shimmer you can see is left over from Haven't The Foggiest and I didn't notice it until seeing the pictures later on! And now for the one I'm sure you've been waiting for, OPI Peace & Love & OPI, the much anticipated duochrome of the San Francisco collection. I can happily report that the duochrome is very strong on this one. It's a strong green/blue shift to a deep purple-y gray polish. Sadly, my camera hated this polish and wouldn't capture exactly how much of a green shift there was here. I even tried an underwater shot with no luck. If you like duochromes though, I would absolutely recommend this baby! I am in love!! I am especially in love here, because sometimes duochromes can be on the sheer side and need 3-4 coats. Not Peace & Love & OPI. This beauty only needed two coats!!!! Two! It's very rich and pigmented, and has lovely smooth application. This is probably the best OPI duochrome since some of the old ones. Maybe even better, because some of those oldies (Man of La Mancha, I mean you) are SO sheer, they are only good for layering. Right after I tried the underwater shot. You can see the water droplets LOL. Sigh... deep navy creme perfection. That's how I would describe OPI Incognito in Sausalito. I can't resist a good navy creme, they are fantastic for wearing alone or layering with glitter! OPI really knows how to do them well. This one is nice and dark, but it looked navy in most lights. In very dim lighting, it would probably look more black, but in all others it looks like the blue depths of the ocean! I probably sound like a broken record now, but the formula of Incognito was lovely. Two coats for full opacity and smooth application. Love this!! So far, I've tried 9 out of the 15 polishes in the OPI San Francisco Fall 2013 collection and I honestly really like all of them. The formulas are so great that even if I own something similar, I'd give that one away and keep the OPI one. I am really excited to try the other 6 in the collection and I'll have those swatches for you soon! San Francisco by OPI will be available August 7, 2013, at Professional Salons, including Beauty Brands, Beauty First, Chatters, Dillard’s, jcp Salons, Pure Beauty, Regis, Trade Secret, ULTA and ulta.com for $9.00 ($10.95 CAN) suggested retail for each nail lacquer.